My Handbound Books - Bookbinding Blog: Inventory sale! 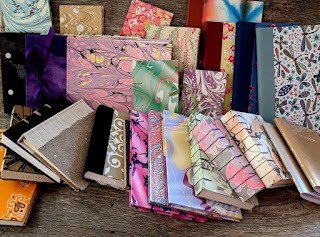 Over the last few years, I have taught a lot of bookbinding classes. Every time I teach a class, I make samples of the books beforehand and then make them again during the workshop. As such, I have accumulated a pile of books that are starting to create a storage problem. And I really need only one or two samples of any particular binding. So -- I have just listed 25 books in my etsy shop. They are all at least half price, and I'm offering FREE shipping to Canada and USA. If you ever wanted a nice handmade book, here's your chance! Or if you are one of my bookbinding or marbling friends and you think you might like to trade something, I am totally up for that! Follow this link to see all the books on sale: https://tinyurl.com/25handmadebooks.